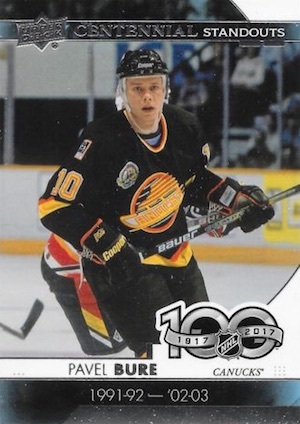 While it's not the first NHL set each year, for many, the new collecting season really doesn't start until 2017-18 Upper Deck Series 1 Hockey. Headlined by the storied Young Guns rookie cards that fall six per box, the hobby format also delivers several inserts and parallels, plus a small shot at some extremely limited cards. 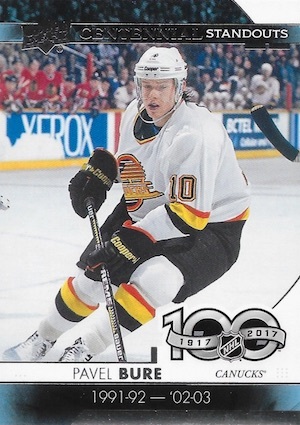 Of course, the 2017-18 Upper Deck Series 1 Hockey checklist includes 250 action-filled cards in the main set, with 50 being Young Guns (1:4 packs) showcasing the first live rookie cards for some of the top incoming players. Limited parallels for the base set include the standards: Exclusives (#/100) and High Gloss (#/10). Returning, too, are the Clear Cut PETG parallels, which are only found in physical hobby formats at a rate of 1:72 packs. While not technically part of the base set, many collectors treat the 90-card UD Canvas set as an extension. These cards promise "mind-blowing photography" and average 1:6 packs. In addition to the base Canvas cards (1:7 packs), the Young Guns UD Canvas subset is a bit more rare at 1:48 packs. 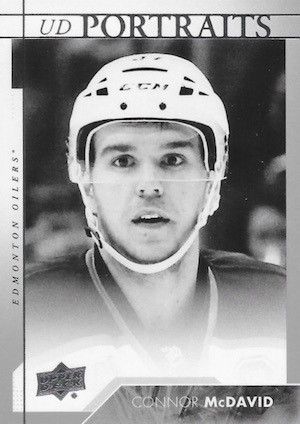 Building on the base set, 2017-18 Upper Deck Series 1 Hockey also makes it mark with a variety of inserts. New options include Centennial Standouts (1:5 packs) and SP Photo Variations (1:1,000 packs). The Second Six is also not an easy pull at 1:1,000 packs. 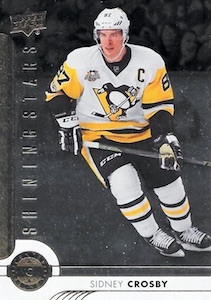 Combining to average 1:8 packs, the foil-based Shining Stars includes Centers (1:16 packs), Left Wingers (1:24 packs), and the tough Goalies (1:48 packs). There are also more elusive Red parallels that should come in each hobby box. Getting up close and personal are the UD Portraits (Base - 1:7; Rookies - 1:60 packs) cards for key veterans and first-year players. Gold Foil (#/99 or #/25) and Platinum Blue (#/25 or #/5) parallels increase the Portraits' rarity. Adding in more acetate, the Clear Cut Superstars (1:400 packs), Clear Cut Honoured Members Update (#/100) and Clear Cut Leaders (#/10) inserts don't emerge too often. Clear Cut Foundations pairs up multiple players in Duos (#/25) and Trios (#/10) editions. Following up its debut in the 2016-17 set, Ceremonial Puck Drop returns with a fresh dozen and very tough odds of 1:2,000 packs. Autograph versions are even more rare at 1:16,000 packs. Naturally, it wouldn't be flagship UD without Day with the Cup (1:2,000 packs) in honor of the title winners. While 2017-18 Upper Deck Series 1 Hockey has a lot that gears more to the base and insert variety, it is not without the hits collectors love to chase. UD Canvas Signatures is limited to the player's jersey number while Signature Sensations falls around 1:288 packs. 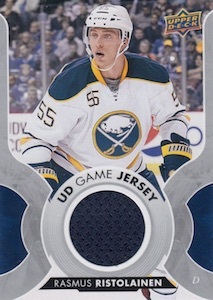 There is also the familiar UD Game Jersey in base (1:36 packs) and Patch (#/15). Honoring specific milestones are the APH 300 Win Club Jersey (1:7,200 packs) and Patch (#/10), 500 Goal Club Jersey (1:7,200 packs), and 1,000 Point Club Jersey (1:2,400 packs). 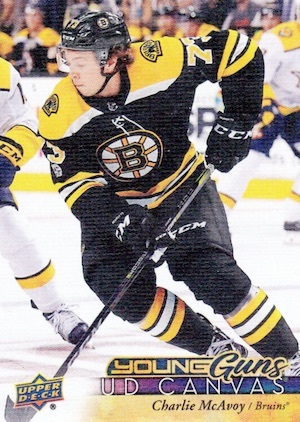 2017-18 Upper Deck Series 1 Young Guns Canvas #C91 Nolan PATRICK. Mint RC. 2017-18 UD Hockey Series 1 Parkhurst #PR-1 Clayton Keller Black SSP!!! Pack odds key: h = Hobby, e = ePack, r = Retail, b = Blaster, f = Fat Pack. 250 cards, including 50 Young Guns. Buy base sets on eBay. Young Guns Odds - 1:4 hobby/ePack/retail/tin, 1:6 blaster. See a full YG guide and gallery. PARALLEL CARDS: Clear Cut (1:72 h), Exclusives #/100 (h/e), High Gloss #/10 (h/e), Printing Plates #/4 (h/e). 1 card. 1:12,000 hobby/ePack, 1:30,000 retail/tin, 1:60,000 blaster. PARALLEL CARDS: Variation 1:72,000 (h/e). 120 cards. Shop on eBay. Base Odds - 1:7 hobby/ePack/retail/tin, 1:14 blaster. Young Guns Odds - 1:48 hobby/ePack/retail/tin, 1:96 blaster. 1 card. Hobby and ePack. Overall Odds: 1:5 hobby/ePack. Some cards have limited photo variations. 1:1,000 packs per original info. Shop on eBay. Work in progress. Let us know if you spot any others. Overall Odds: 1:2,000 hobby/ePack, 1:5,000 retail/tin, 1:10,000 blaster. 7 cards. Serial numbered #/100. 10 cards. 3 per Parkhurst Rookie Previews Blaster. PARALLEL CARDS: Blue (1:37), Red (1:150). RED PARALLELS: Centers - 1:48 h/e/r; Defensemen - 1:72 b; Goalies - 1:144 h/e/r; Left Wingers - 1:72 h/e/r; Right Wingers - 1:72 tin, 1:36 f.
6 cards. 1 per Starter Box. Overall Odds: 1:1,000 hobby/ePacks, 1:2,500 retail/tin, 1:5,000 blaster. Overall Odds: 1:36 hobby/ePack, 1:24 retail/tin, 1:240 blaster. PARALLEL CARDS: Patch #/15 (h/e). No Andreas Athanasiou in patch parallel*. Base Odds - 1:7 hobby/ePacks/retail/tin, 1:14 blaster. Rookies Odds - 1:60 hobby/ePacks/retail/tin, 1:120 blaster. PARALLEL CARDS (Hobby/ePacks): Gold Foil (Base #/25, Rookies #/99), Blue Foil (Base #/5, Rookies #/25). Acetate variations of Young Guns subjects in 2016-17 SP Authentic. 14 cards. 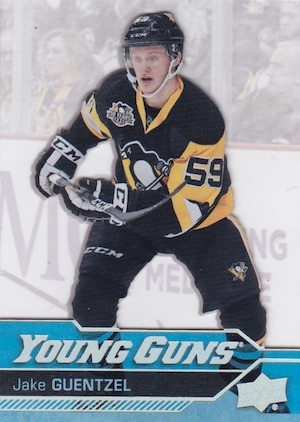 1 per Young Guns Jumbo Blaster. 14 cards. 1 per tin. The design for this years flagship release is nice and clean no problem there. The issue I see will be lack of big name rookies to draw people in to buy more product. The top 2 draft picks this year would have been in the 8 to 9 pick range in past years drafts. Another issue is from what I have heard Panini has locked in a few of the top draft picks this season to exclusive autograph deals so that could further push some collectors away from buying as much product from Upper Deck. PGH247: Leaf has signed the top two picks (Nico Hischier and Nolan Patrick) to exclusive autograph deals. Trey, That’s not good for Upper Deck. Even though neither player is expected to be a franchise type of talent like McDavid, or Matthews were the last few seasons Upper Deck has really dropped the ball by not having autographs of the top two draft picks in Hischier or Patrick in this years product. Going to be hard to convince people to put good money down to buy a ton of product when One: its a bad draft year to begin with and Two: you cant at least get the autographs of the top 2 draft picks either. Upper Deck is really going to have to offer a ton of incentives for collectors or slash product prices substantially. UD Series 1 isnt even about autos, it’s about the young guns, always has been. Not being able to get the auto of Nico or Nolan in UD product is obviously disappointing, and it does seem UD messed up allowing it that to happen. Patrick won’t be in Series 1, as typically they have put the number 2 pick in series 2. So this product to people will come down to, 1) the price and 2) the checklist of young guns. I will still rip as S1 is my favourite UD product. Wonder what the pre sale of Nico YG will be. A RC auto UD product I will stay away from unless they have vet heavy like Gretzky and McDavid ect. Problem is with that is it will flood the secondary market with there autos if they do that, which UD doesn’t care as we all know. I’m interested to see what this year has to bring when UD can’t roll out the number 1+2 auto. As mentioned, UD S1 is all about the Young Guns. It’s never been about Autographs so the Leaf Exclusive Auto deal with the top two picks won’t affect this product. Where it is going to hurt is 17-18 SPA & The Cup. Not many will spend big bucks on those products when you can’t get a FWA or RPA from the top 2 guys. 4 stars for S1 cause it should still be decent but you screwed up again UD, seems to a reoccuring theme with you guys when it comes to Hockey. Gee whiz, upper deck doesn’t even honor auto redemptions anymore. I am still waiting for my 2015-16 exquisite rookie signatures Dylan Larkin I redeemed 2 yrs ago. What really stinks is he has signed numerous cards for last year’s product. I called upper deck and asked them why i haven’t received my card yet and why is he signing cards in the 2016-17 ud products and i get this snooty women telling me that the athlete is committed to sign the cards. I said ok. However, is there not an order in which they sign them? Idk, i use to love upper deck but these days I just don’t know anymore. SP Photo Variations (1:1,000 packs). I am looking forward to this and since this is the first year they are doing it I hope it will be every year from now on. In baseball the variations are some of the most popular cards. I wonder how we are going to be able to tell the variation from the regular base card. In baseball the code on the card is different. The SP photo variations are for the centennial sensations inserts and not the base card I believe. My $0.02… If you’re gonna throw a Marleau 500 goal club in there, why not pair it with a Recchi, Tkachuk or one of the other omissions from that set? I don’t get the logic of leaving it as a standalone. I thought the ‘Second Six’ concept was cool but the execution seems like a misfire. If you want to dip into nostalgia like this, I wanna see at least one blue Penguins jersey. And Simmer had all of like 20 points for the Seals. At least throw Gilles Meloche in there for the novelty. And Bob Rouse? Really? The signature sensation selection is junk and not a single retired star UD game jersey? I like the centennial standouts, but wish we knew which ones would have photo vars. Clayton Keller is in series 2 so why is his YG card image shown here? Leaving his card for series 2 is just another UD mistake imo when it’s already difficult to justify spending the same $ as last year for boxes/cases. Hischier and Mcavoy are not McDavid or Matthews and people already asking for $50 or more for their YG cards are insane. Lars: The Keller YG image is a mock-up from the Series 1 solicitation. This was well before UD decided how to divide the Young Guns between Series 1 and Series 2. Ok thanks Trey for clearing that up. Does Brock Boeser have 2 yg? I seen pic of his yg in Home jersey and some in away? Ed: Both are mock-ups. The white jersey version is what the actual card will look like. A lot of good rookies this year… it will be a suprisingly good year for hockey cards– xcept for the fact Nico and Nolan not signing for UD..
Any chance there will be a retail version or any retail hockey 17-18 products released? Jonathan: There are several retail formats for UD Series 1. If you look at the odds on the checklist, you will see standard retail boxes, along with blasters, fat packs and tins. A few inserts are exclusive to these formats. I found the ratio of inserts in the boxes coming from one case not to represent what is described by upper deck. Ex; one box had 8 canvas cards (no young gun canvas), only 2 young guns. Another box had 8 young guns and only one canvas. The other inserts were also overloaded too. I bought 5 boxes and only one had the upper deck ratio of: 6 young guns, 4 canvas and the other inserts. If I were only buying one box and and got one with this distorted ratio I’d been upset. I won’t be purchasing anymore hobby boxes. Like the cards, but not the distribution ratio per box. I opened 1 Box and pulled the Hischier & McAvoy YG, I don’t think I can do much better!! I’ve only spent $60 so far and I have already hit the Lundqvist canvas auto! Made this NYR fan’s day! Nice product and affordable to the everyday collector. Love UD series 1 and 2 every year. Great look to the cards this year, subpar rookie crop is not UDs fault and after 2 years of McDavid and Matthews, the hobby was due for a year without a truly marquee rookie. After watching some breaks, Hischier and McAvoy seem to be paired up…but my box did not follow this pairing. See any of those names, expect the rest to follow. I’ve seen a bunch of breaks with this matchup. I got the same young guns except I got a Debarincat canvas. Overall the quality is great this year. I am looking foward to collecting. I like how they have added some new inserts to collect, especially the second six. Very good set. Nice design, very clean, although some of the pictures are a bit blurry. Good checklist. Main issue is the faulty distribution of the cards. I’ve noticed many patterns, not only the one mentioned above. I really like the black and white portraits, the clear cut acetates, all along with the base acetate parallels and all the other acetate inserts. The Centennial Standouts represents a nice addition especially with the variations, which is very baseball like. UD should try to renew a bit Shining Stars the same old design over and over again. All in all, a 4 stars product for me. I pulled a non-listed Centennial Standouts Photo Variations of Red Kelly #CS-54 in a red jersey. I thought I might list it here as it indicated to let you know if we find any others. Thanks. Just broke open a tin purchased at Target. Pulled 2 UD Canvas, 2 UD Portraits, 3 Young Guns, 1 Shining Stars and 1 UD Game Jersey. Great photography and unorthodox images (at least two cards in my tin featured players juggling soccer balls). Not much allure in the chase this year. I won’t spend much this year but it’s still worth opening some packs. Bought a blaster box at Target. Every card had dinged corners or terrible shredding along top border. Classic UD quality. Avoid if you care about condition. I was told by UD customer service I would have to have every card graded less than 9 to get replaced. I AM NOT KIDDING. $22.00 down the drain. Glad I didn’t buy hobby! Typical UD flagship product. Hopefully the price will go down a bit as the rookie crop isn’t as stellar as the last few and the long odds hits are stupidly long. Also getting really sick of seeing patterns among the YG’s. Yeah, you might hit the Hischier/McAvoy box but if you don’t, it probably won’t be good. Definitely for the set builder and YG collectors, if you do hit the lucky box, the rest of the YG’s can be had fairly cheap on eBay. My advice is to wait a few weeks and the value of these cards will soften a bit. I give this four stars because the design is good and there is more value than most collectors think. While I am not a big fan of UD’s monopoly and of some other products this company has butchered (see the horrible Maple Leafs Centennial checklist), series one has some good rookies and enough short print sub sets at resonable odds to shoot for. The canvas cards are always nice and popular. The price point is better than those high end ridiculous lottery packs/boxes that many on this site complain about. Series two should be just as good. Just opened a tin purchased at Wal-Mart. Average, about what you would expect for a retail product. 2 YG (Logan Brown, Marcus Sorensen); 2 Canvas (Mathieu Perreault, Mike Green); 2 Shining Stars (Nikita Kucherov, Patrick Kane red); 2 Portraits (Mikko Rantanen, Connor McDavid); Matthews, Marner, Eichel were the best of the base cards. BOUGHT 3 BOXES ALL THE YOUNG GUNS ARE THE SAME. ON THE BACK IT IS SAYS 2017/2018 UPPER DECK SERIE ONE. HOW CAN IT BE. 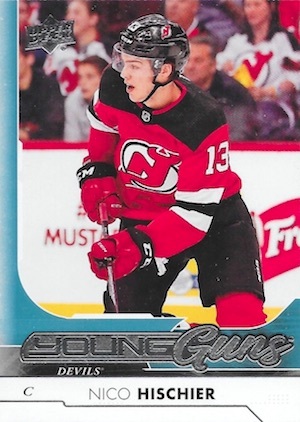 Looks like Upper Deck inserted Clear Cut editions for the Young Guns Update from 2016-17 SP Authentic. Not bad set. I just bought two boxes on epacks. Pulled two Rookie Portaits (Nylander and Boeser). In my second box I pulled MaCovy, Boeser and Yamamoto. No Nico with the MaCovy. In one of the packs I pulled a jersey card, exclusive card and a canvas. Always a great product at an affordable price point. There are a lot of variants for the centennial standout set. I just got a Gretzky #99. Many are obtained through epacks. I don’t know if you will find them in boxes. I’m purchased 40 packs at the dollar tree today and I wasn’t happy when I got home I realized they where only 4 cards per pack. I opened all 40 packs and the where all base cards not 1 YG or insert… The package looks the same as retail packs and they still say on them find young guns rookie cards… A little bit of false advertising in my opinion…. UD is really going to s*** these days. I can’t believe how horrible these packs were. I bought a wax box 24 packs of the 2017-18 upper deck series one hockey cards and i didn’t get a single rookie card, autograph card, or even a jersey card!! Not one. I have been collecting cards for 30 yrs. I have never felt so cheated and ripped off. I can only imagine how many little kids you have sold them to already. I just finished putting together sets in binders for two nephews and one grandchild. The last set, I bothered to view the checklist. No base card for McDavid Or Crosby. Are you kidding me? I will not be buying a case of tins this year. Hit my first high gloss Young Gun. This is the best ‘flagship’ product of all 4 major sports. 2017 18 Upper Deck Series 1 Hockey HUGE Factory Sealed FAT PACK Box-576 Cards!